Ralph doesn’t look as finished as his movie, because this is what he looks like in his new VR experience. Recently, I found myself fighting off evil drones and saving the internet using nothing but a trusty weapon that fires milkshakes and pancakes. This, of course, happened in virtual reality. 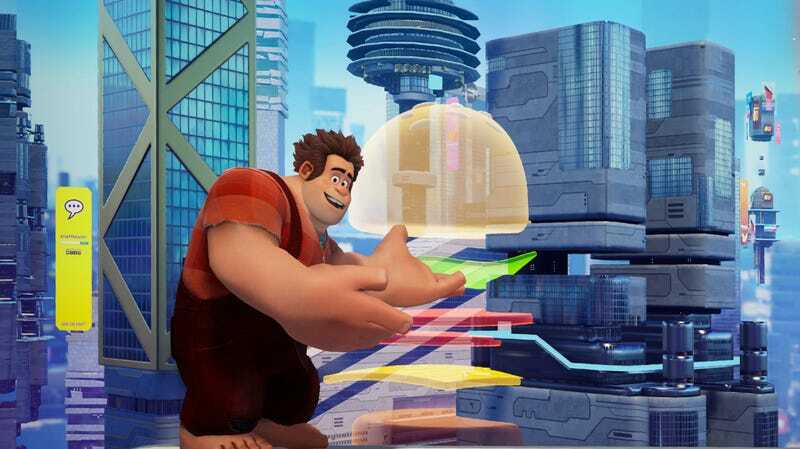 Specifically, the Void’s latest collaboration with Disney and ILMxLAB: Ralph Breaks VR, based on the films Wreck-It Ralph and Ralph Breaks the Internet. Much like the Void’s previous experiences, Ghostbusters Dimension and Star Wars: Secrets of the Empire, Ralph Breaks VR puts you, the player, in a fully immersive, fully mobile, virtual reality experience. You can walk, you can talk, you can interact with the environments, and, eventually, you can shoot milkshakes and pancakes at creatures just like in the trailer for the new movie. It comes to multiple Void locations on November 21; this week, io9 got to play it and speak to some of its creators. The first, and maybe best, thing you notice in Ralph Breaks VR is that it’s not merely echoing the new movie. While the experience takes place on the internet (the setting of the Ralph Breaks the Internet), it has a huge component that harkens back to the thing that made Wreck-It Ralph awesome in the first place: retro video games. “We even talked about whether or not they should go to the internet [at all],” added Pamela Ribon, who wrote the VR experience and co-wrote the new movie. “[We thought] ‘Maybe they should just be in Litwak’s Arcade.’ But then I remember thinking, ‘The internet is gonna look so pretty, you guys.’” And it looks beyond pretty. Without giving too much away, Ralph and Vanellope sneak you and your team into the internet to play what Ralph describes as the best game ever. Since this is Ralph, though, the game doesn’t end up being something new and exciting. It’s more like Space Invaders inside Tron and it’s called Dunder Dome. That sounds sort of humdrum—but in virtual reality, you are literally inside that game, firing a huge canon at little aliens zipping all around with Ralph and Vanellope offering commentary the whole time. It’s immersive and wild, and that’s just the beginning. Things then go from the more 8-bit vibe of the first movie to the expanded internet from the sequel, with a few story twists that eventually have you grabbing that aforementioned Maker of Milkshake Mayhem and wreaking havoc with Pancake Power. 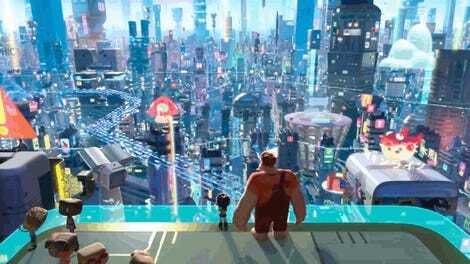 The idea of milkshakes and pancakes comes from the very first teaser trailer for Ralph Breaks the Internet, but, minor spoiler alert, was actually cut from the final film. That posed a bit of a problem for the teams working on Ralph Breaks VR because, well, that was kind of a huge part of their game. “We saw an early cut of the movie and [Pancake Milkshake] gets this huge laugh and we were like ‘It’s going in!’” said Jose Perez III, the lead experience designer from ILMxLAB. “And then we heard it might get cut and we were like. ‘B-but...Pancake Milkshake? This will be a thing.’ So we just kept pushing for it and I think it paid off.” It does but, well, we’ll leave that for after you see the movie and play the game. The bunnies run rampant in Ralph Breaks VR. One of the coolest developments in that back and forth is that Ralph Breaks VR was able to resurrect a character that film directors Rich Moore and Phil Johnston cut from Ralph Breaks the Internet. Ralph Breaks VR opens November 21 at 7 Void locations across the U.S. and Canada and will be happening concurrently with the amazing Star Wars experience, Secrets of the Empire. Check www.thevoid.com for locations, tickets, and showtimes.